In this post I will show you on an image how ShixxNOTE program can be effectively use in your office or at any network (LAN). This example is about software company and how can developers in it use program to speed up a process of development. 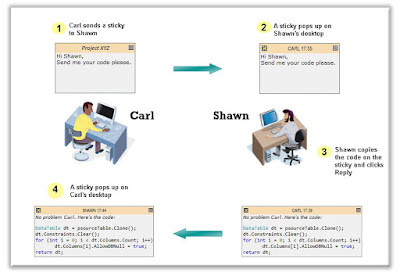 From this image you can see communication between two developers Carl and Shawn. 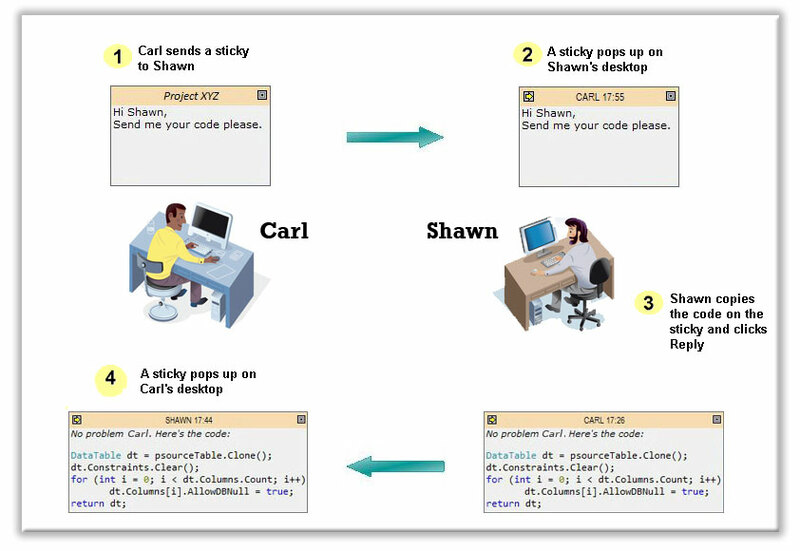 For example Carl sends a sticky note to Shawn, because Shawn is on the second floor or the office but he is in network (LAN) he receive note promptly. He simply modifies note and copies his code. After that he use ShixxNOTE note menu option "Reply to CARL-PC". After that in a second Carl receive modified note with code which he needed and loop is complete. This example shows how only 2 computers with ShixxNOTE installed on it can communicate promptly. But Carl could send his note to Shawn, Peter and Marc which are his work colleagues. He could save that recipient list as a "Project X Team" and after that he simply create note and from note menu send note to saved group "Project X Team" and then Shawn, Peter and Marc will receive notes promptly. I hope you understand how this is cool ! You have one program ShixxNOTE and all communication goes through it. In my company we use this for more than 5 years. But my latest customers are from medical background. Many dental offices from US, medical institute from France, etc. I find out that they have a need for ShixxNOTE. Hope they will spread out the word about my program ShixxNOTE. P.S. At the program site, you can find new version of program which now have some cool transparency effects and some minor improvements. This is release from September 2012.